There is nothing quite like the irresistible aroma of fresh baked bread, especially during the colder months because the kitchen gets all warm and toasty too. For hours, my entire space was filled with the heavenly scent from this spiced bread. I could hardly wait for it to cool down before I was able to slice it and enjoy. If you are looking for an appetite stimulant, you can't do much better than homemade bread. I don't usually make yeast breads. Generally I prefer to make quick breads that require little kneading. At the same time, I have fond memories of my mother's homemade white bread that rose to enormous heights. It was a special childhood treat. Armed with that memory, and inspired by a traditional bakery bread from Bangalore, I was curious and bold enough to try my own version. 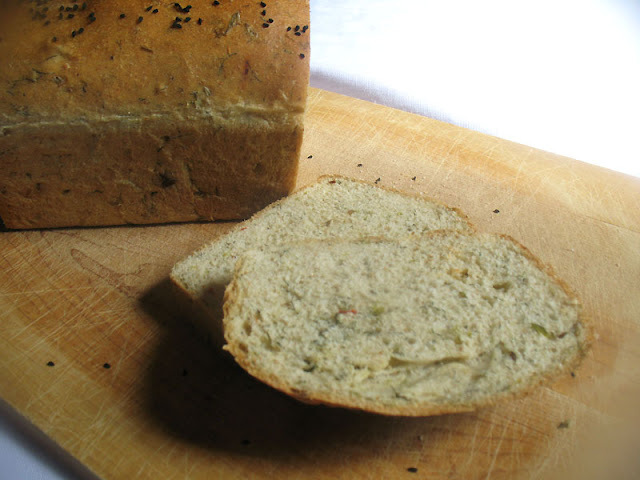 There are a plethora of recipes for this spiced and herbed bread and it took some time for me to draft a recipe. Never having been to India, or fortunate enough to know someone who makes this bread, I could only imagine the flavors based on my experience with Indian cuisine. Usually I am more a cook than a baker, but I do enjoy baking and I was up to the challenge of patience because yeast breads generally require a lot of kneading and resting time. Considering this bread was virtually devoured in little time at all by my husband and best friend Basil, I would say it was a pretty successful effort. With the exception of a few air bubbles near the top of the loaf, the texture was soft and chewy with a delightful browned crust. 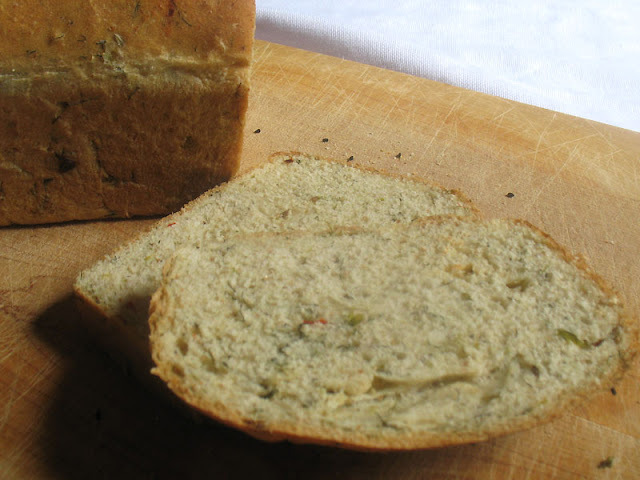 The spices and herbs added a whole new depth to my experience with yeast breads. It's delicious served warm with a pat of butter, but keeps well for a day or two. With just a hint of heat, the cumin, onion and chilies are nicely balanced by the herbs. To make the masala blend, heat the oil in a skillet over medium-low heat. When hot, add the cumin seeds and stir until they darken a few shades. Add the onion and sauté until translucent, about 5 minutes. Stir in the chilies and sauté for another minute. Stir in the fresh herbs and salt and cook for another minute. Remove from heat and let cool. For the dough, heat the milk and water together in a small saucepan over low heat until lukewarm. Pour into a large bowl and mix in the yeast and sugar until dissolved. Set aside for 15 to 20 minutes until frothy. Then stir in the oil and salt. Gradually stir in the flour and herbs until a dough is formed. Turn the dough out onto a lightly floured board and knead for about 15 to 17 minutes until the dough is soft and smooth and not sticky. Add more flour during the kneading process as needed. Shape the dough into a round and transfer to a greased bowl, turning the dough to coat with the oil. Cover the bowl with a clean kitchen towel and let sit in a warm space until doubled in volume. This should take about 1 to 1 1/2 hours, depending on how warm it is in the kitchen. Punch the dough down to deflate. Transfer the dough again to a lightly floured bowl and gently knead for another 7 minutes to help work out any air bubbles that have formed. Shape the dough into a loaf and transfer to a greased 9 × 5 inch loaf pan. Cover the pan with the kitchen towel and let sit to rise in a warm place for another hour. Preheat an oven to 375°. 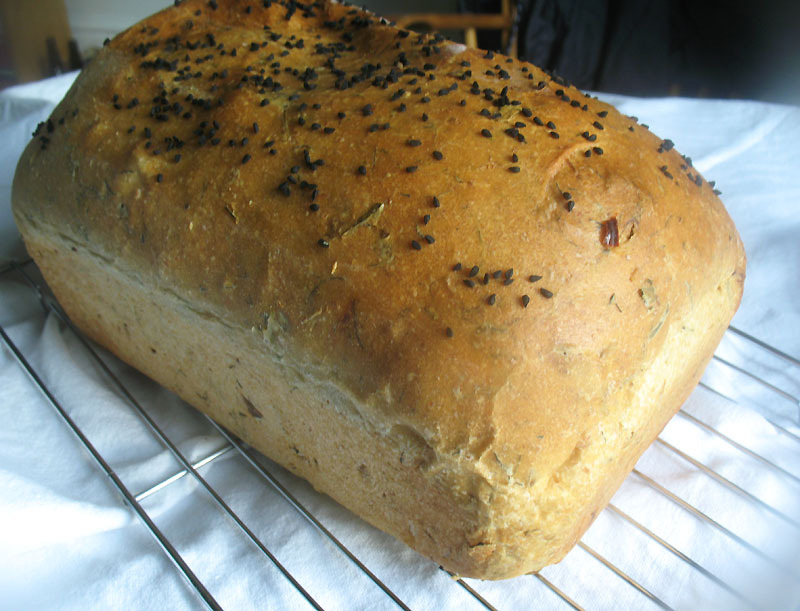 Brush the top of the loaf with milk and sprinkle with some nigella seeds if desired. Bake for 30 to 40 minutes until the bread is golden on top and it sounds hollow when tapped. Let the loaf sit in the pan for 5 minutes. Gently run a knife along the edges of the bread and carefully transfer to a wire rack to cool completely before slicing and serving. Looking forward to making this mouth watering loaf of bread in my kitchen. Absolutely fantastic pictures!